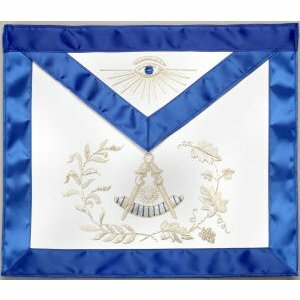 This Past Master Apron is Hand Embroidered in Silver Bullion with Blue Bullion accents using Old World embroidery techniques.The apron is trimmed in a Royal Blue Satin ribbon. The apron has an adjustable web belt with a " T " hook closure, perfect for a waistline of up to 50 inches. The apron measures approximately 13" x 15" and has a blue satin lining and pocket on back.